I’m starting to like my body. I’m starting to like myself. I feel happy. Good things are suddenly coming to me easily and bountifully. It’s as though I finally got a ticket to sit at the banquet table, and The Universe is putting exotic, delicious foods in front of me that I have dreamed of but never tasted before. And all I have to do is think about what I want, and it appears. A few weeks ago, one of my very good friends (for more than 20 years now) and I were discussing our “bucket lists.” He’s been globe-trotting, bungee-jumping and mountain climbing his way through the continents in his quest to check off his goals. He asked me what was on my list. Now, I have no burning desires to jump off tall structures with rubber bands attached to my ankles, and no yearning to jump out of planes or scale huge rocks. But I do want to see the world and experience other cultures. 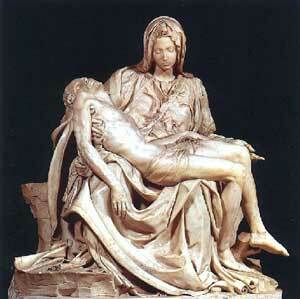 The first thing I mentioned to my friend was that I’d like to go to Italy and see La Pieta, by Michelangelo. Okay – let that simmer on your back burner for awhile. A couple of days ago, my ex and I ironed out a slightly complicated visitation schedule change, intiated by him. (I was smart this time, and asked for something in return. The “give and it will come back to you later” principle doesn’t work with him – only negotiations.) So, one of the results of this is that he will now have the kids over Presidents Day weekend instead of me. A few hours later, my “bucket list” friend IMed me to say he just received his next business trip itinerary, and he was off to Europe – London, Stockholm, someplace in Germany, and Rome. Of course, I congratulated him and told him I was envious. And, just like that, he invited me to be his guest in Rome. When would he be there? For a week, beginning Presidents Day weekend. I’m going to Italy. Wow.